Today, I joined a few hundred people in my relatively small city at a rally to protest the Trump administration's policy on immigrants seeking asylum. I was proud to march with hundreds of thousands of protestors across the country who are furious at Trump's policies and rhetoric about immigrants and families seeking asylum. One of the reasons I started Magnify Progress was to give people an outlet for their frustration and passion about issues. A successful manifestation of this has been the Facebook fundraiser for RAICES, a nonprofit that promotes justice by providing free and low-cost legal services to underserved immigrant children, families and refugees in Texas. I was lucky enough to see the couple that started this fundraiser speak today at the rally, and speak to them. "We did what we think anyone would do. And it turns out there were 500,000 other people who had the same idea"
This Facebook fundraiser, "Reunite an immigrant parent with their child," has given people an outlet to protest on, and to show that they are not okay with what is happening to families and children at the border. Wildly surpassing their goal of $1500, people have donated more than $20 million to RAICES, which is working to help reunite families that have been separated, and represent people seeking political asylum. 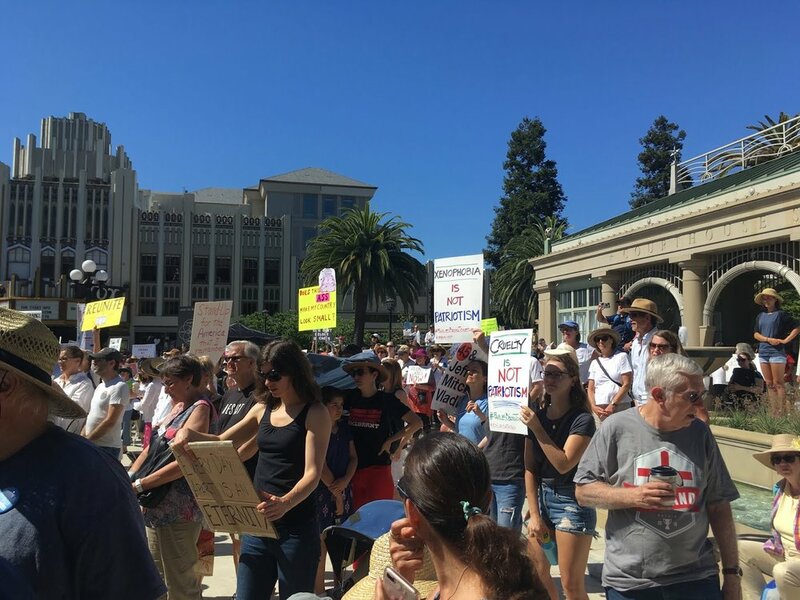 As the #FamiliesBelongTogether rallies take place across the country, the obvious question is - what happens next? Hundreds of thousands of people organized today and marched, hundreds of people shared their own stories about immigrating with their families, but where do we go from here? I like to think that the success of the RAICES fundraiser means that there are millions of people who want to help reunite separated families, and do not support the zero-tolerance policy. For those who want to do more, here is a list of actions you can take to show your support for families and immigrants. Magnify Progress has 20+ actions you can take now to help families that have been separated, from calls to your representatives to co-sponsor legislation (S.3036 - Keep Families Together Act; HR. 2562 - Protect Family Values at the Border Act; HR.5950/S.2937 - HELP Separated Children Act; HR.2043/S.2468 - Fair Day in Court for Kids Act of 2018), ICE offices you can protest at, calls to DHS to end cruel practices, organizations to donate to, and petitions to sign. Right now, there are many people asking if there is an actual plan to reunite children, and how to start helping. It is a massive data and logistical problem, but we have been working (with our amazing friends at ProgCode) to build out a map of all the places that children have reportedly been sent to. Sadly and surprisingly, many of us live in cities where unaccompanied children are currently being housed. Take a look at this map, which we will continue to update with new information as we learn more, and make calls to confirm status. We will be adding actions that people can take based on the data from this map, but for now, please use this to increase awareness. RAICES - The Refugee and Immigrant Center for Educational and Legal Services. Parents separated from their children at the border (and other immigrants placed in detention) can’t get released from ICE until they pay the full amount of their immigration bond. Bonds are set at a MINIMUM of $1500, and are usually in the range of $5-10K, even for asylum seekers without any criminal history. There is also a RAICES Bond Fund you can donate to. Texas Civil Rights Project - TCRP is fighting around the clock to reunite the 381 families we represent and to ensure that they get excellent legal representation on their underlying immigration claims. We’ll continue to go to court every day in South Texas to monitor and protect against the ever-changing policies of the Trump Administration for as long as it is necessary. Kids In Need of Defense - Your help could mean the difference between a child who needs protection being sent back to his or her home country where his or her life may be in danger - and the child being able to stay in the United States to live in safety and freedom. It is important to remember that as much as these organizations need volunteers, organizing large scale volunteer efforts is an incredibly difficult and time intensive task. Sign up, email to reach out, but do not think that a slow response means that your help is not needed or appreciated. I have personally called many of these organizations, and they are incredibly grateful for the outpour of support, but need to hire staff to handle the huge increase in volume. I know it's frustrating when you're ready to help, but offer your help sincerely, and call/donate/protest while you wait for an answer. If you have questions, corrections, or would like to contribute to Magnify Progress, or the map, contact us at contact [at] magnifyprogress [dot] com.